I have mixed feelings about this time of the year. The salmon begin to return to their natal streams but my eagle friends always disappear. Eagles take care of their eaglet/s all summer.Come August the eaglets are big enough to become fully fledged.They literally fly the coup leaving mum & dad. So Mum & Dad go on a salmon vacation. They fly further north to their favourite salmon streams for some well deserved R&R. They leave for about a month.I haven’t a clue where they go but suspect further north as those streams are already spawning.The further north you go the sooner the spawning happens.Alaska started a month ago & Washington State (south of us) will start 2 or 3 weeks after us. So I’m very happy to see the salmon returning but always sad to find my fine feathered friends are gone.The Daredevil & Delilah are gone. Maggie & Moe have already been gone for over a month. (I suspect they are too old to have anymore eaglets & so left sooner than most?) Juliette is gone,leaving only my buddy Romeo.I suspect he’ll be leaving any day now. So I say goodbye to some but hello to others.I will be checking several streams tomorrow to see If the salmon have started to arrive? 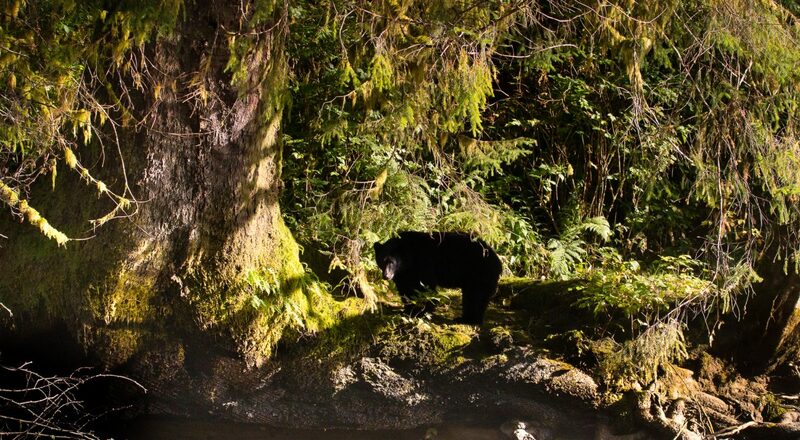 Always exciting to go upstream looking for bears cruising for salmon! 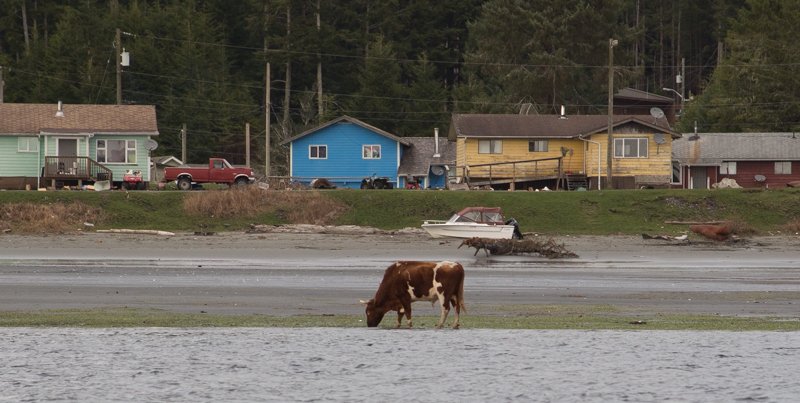 Those houses in the background are in Opitsat.A First Nations village on Meares island. These Bovines seem to be almost like mascots for Opitsat.Opitsat is a First Nations village.It has been there for several thousand years! Nobody bothers the Bovines & they just graze along the shoreline. I wonder if someone has named them? Opitsat is a Native village on Meares island. It has been occupied for several thousand years. I noticed some Bovine down on the sand eating the Ell grass. I’ve heard these cattle are semi Feral. They basically go & do whatever they want? I’ve also heard that their meat tastes badly because they eat the Ell grass,so nobody wants to eat them I guess?